Cutting-edge innovation for a new benchmark in playmaking. The Magista Obra is made for the world’s most effective playmakers. 3-D texture on key areas of the boot provides targeted friction for a precise touch. NikeSkin and ACC (All Conditions Control) create durability and all-weather grip that ensures the ball sticks to your feet when kicking. 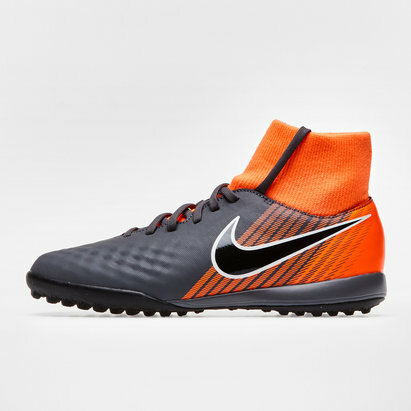 Shaped Dynamic Fit collar links the lower leg and foot without impeding motion, plus the Nike FlyKnit constructed upper with a synthetic overlay that delivers a comfortable and snug feel and moulds to the wearer's foot. Flywire cabling in the boot ensures mid-foot stability and a lockdown fit, ideal for pacy manoeuvres.